Broadly speaking, equities (SPX + ~1.3%) outperformed commodities (CRB + ~0.75%) last week, with emerging markets (EEM + ~5%) strongly outperforming the SPX (+ ~1.3%). 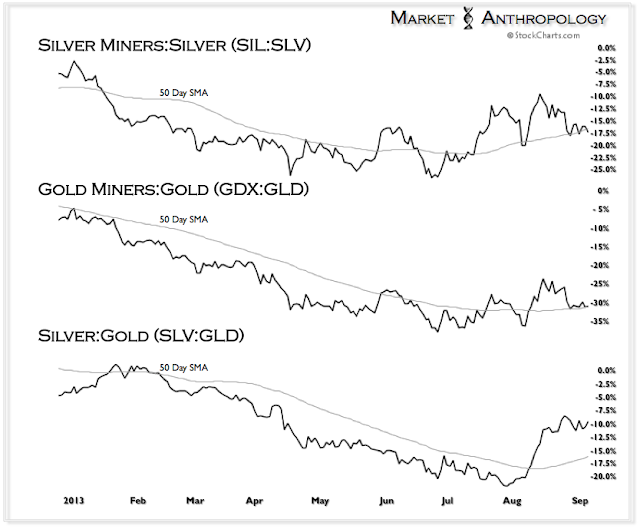 Silver, our leading proxy for the CRB & CCI had a strong close for the week (+ ~1.5%) and modestly outperformed gold (- ~0.35%). 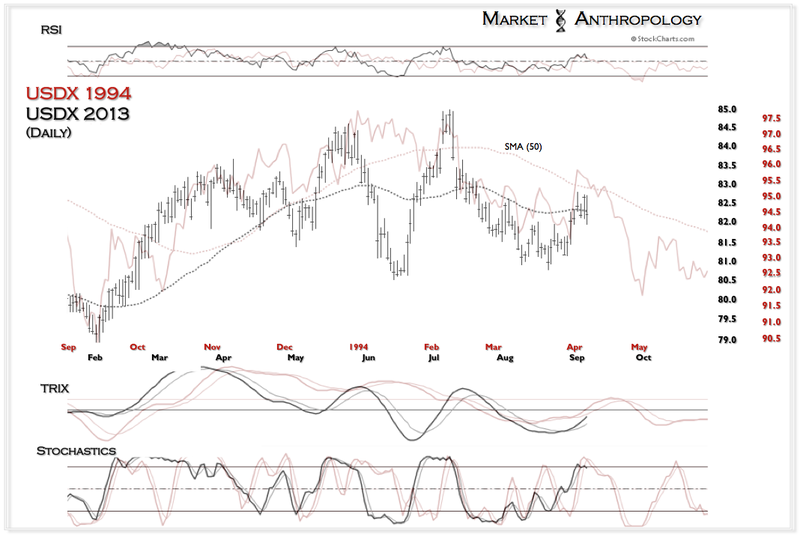 Commodity currencies, such as the Australian dollar (+ ~3.2%) had an exceptionally strong showing, while the USDX started to roll-over at its 50 day sma. 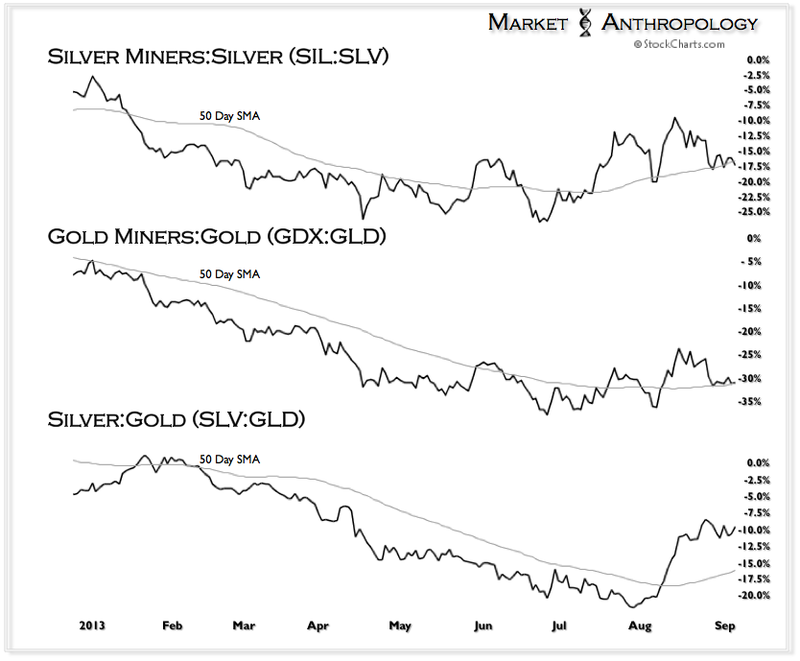 Gold (GDX - ~0.4%) and silver (SIL - ~0.25%) miners underperformed spot prices after consolidating very sharp gains in August. Although we favor precious metals through the fall, should the rally fail - we wanted to highlight a few possible scenarios. 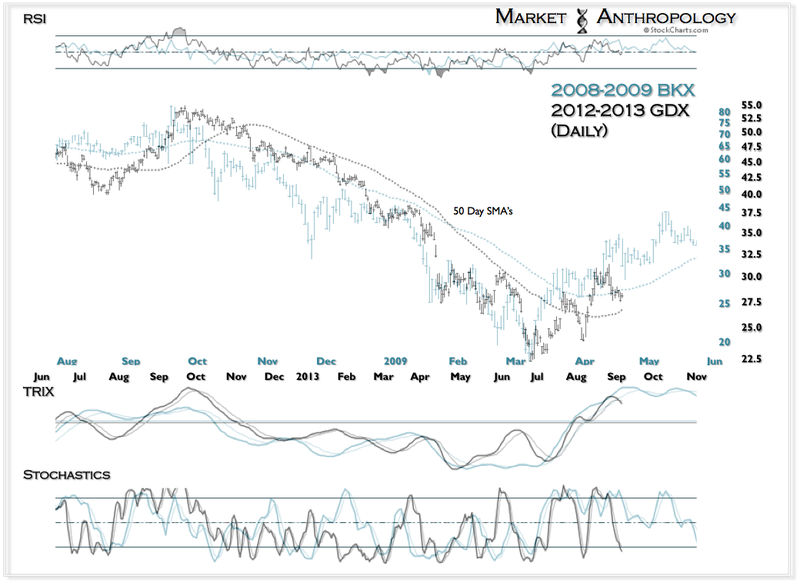 We continue to focus on silver, because of its leading relationships with gold, hard commodities and corners of the currency markets. 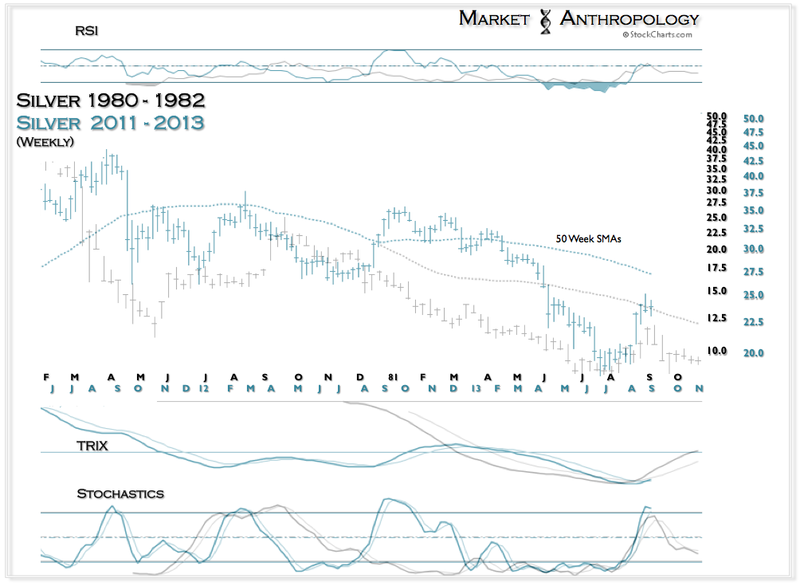 Recognizing seasonality, below is the sharp retracement rally for silver in 1981 that rolled over in September. 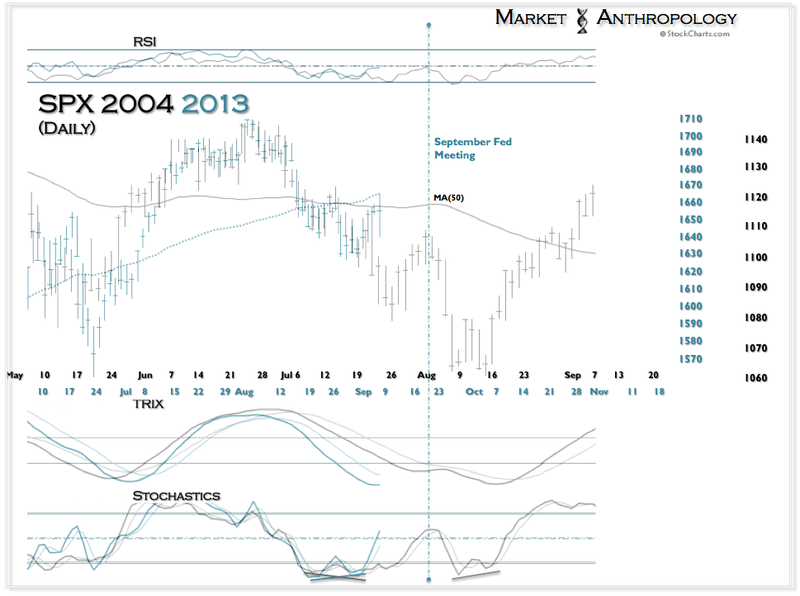 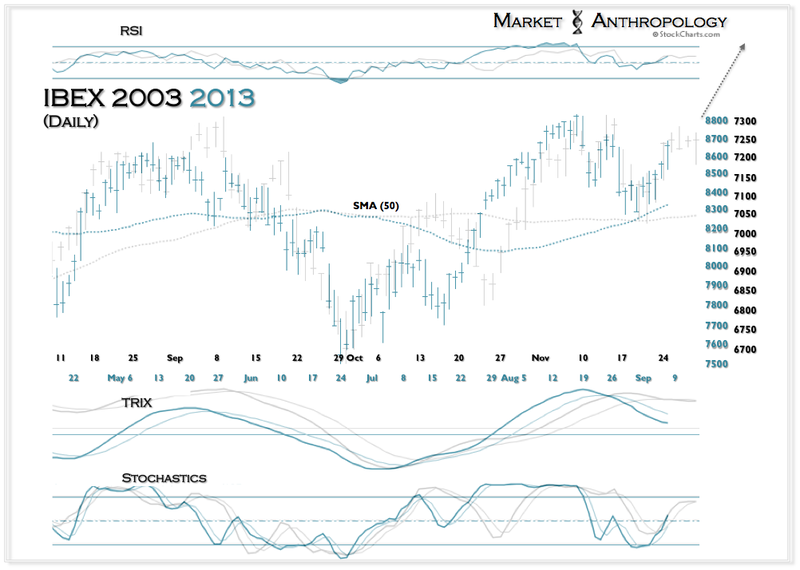 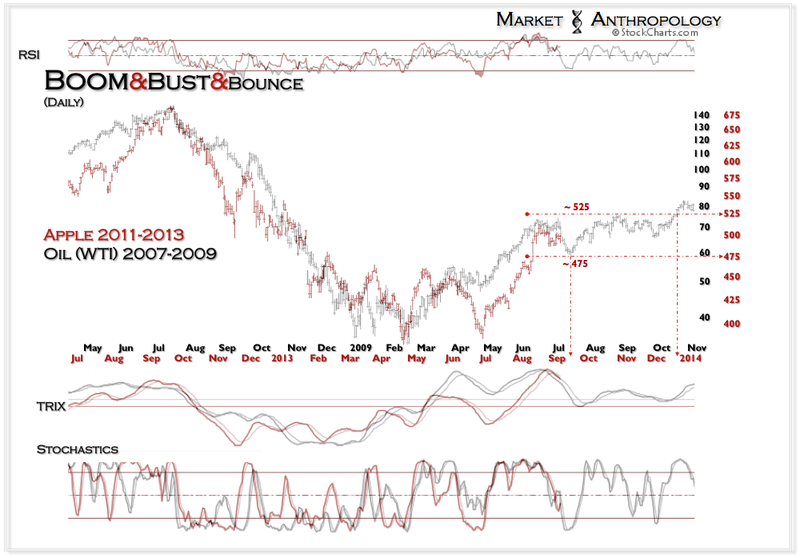 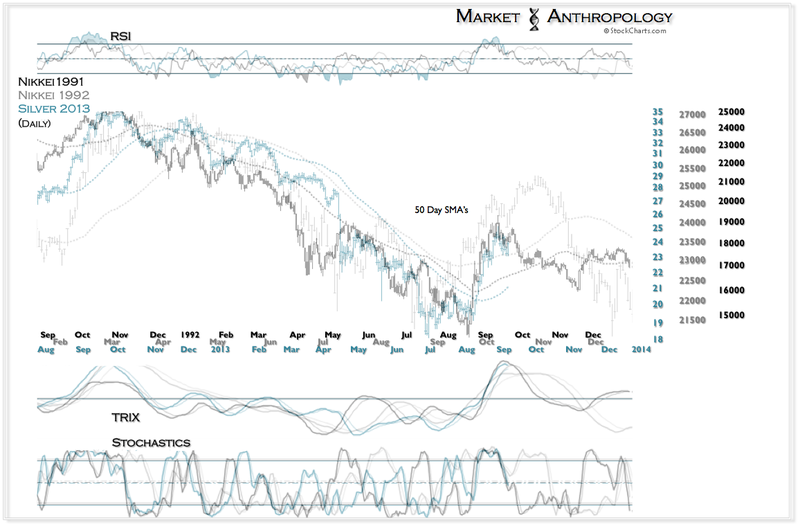 With that said and as shown above in its weekly series, the current rally was from a substantially more oversold condition and has already extended itself above the top rail of the stochastic oscillator. 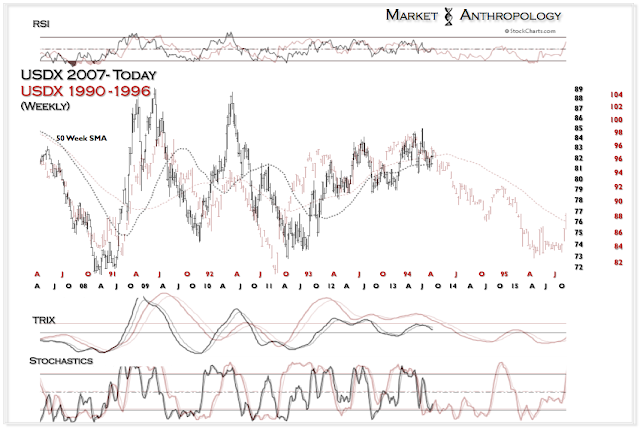 This set-up is actually more representative of the tradable and long-term low that silver made a year later in June of 1982 (see series below). Taking into account the great utility it has provided us on the short side over the past year, it would be foolish to ignore the structure and momentum profile of the Nikkei - circa 1992. 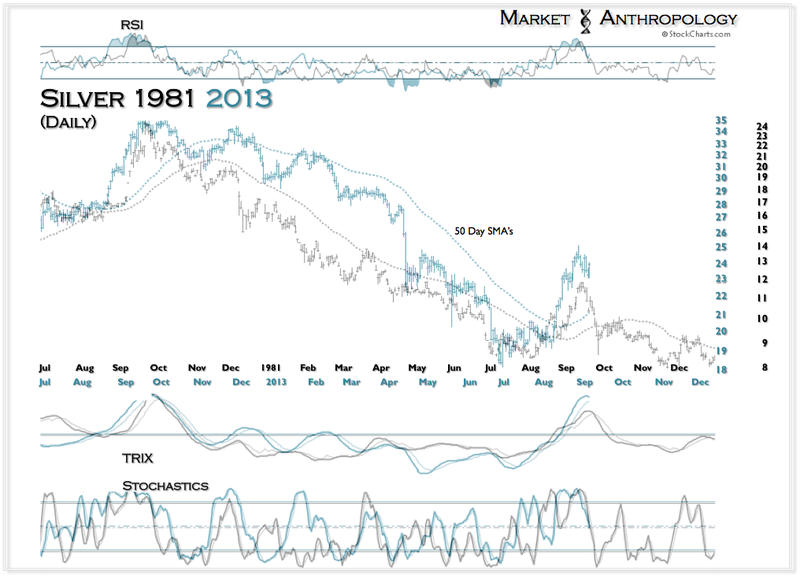 We included the profile of 1991 as well that we had used last year coming through the fall. 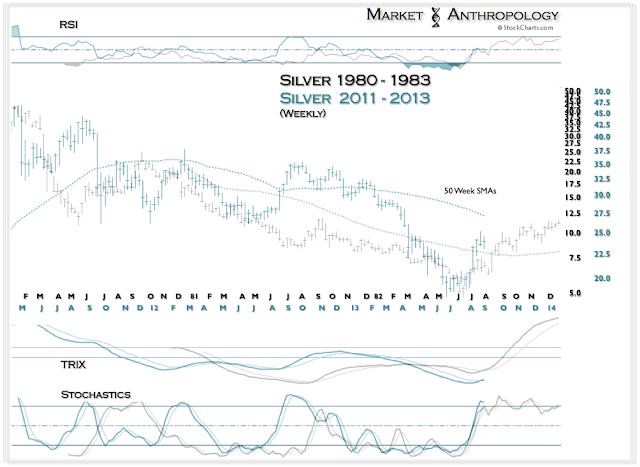 The Aussie appears to be walking in silver's month-old footsteps. While we doubt the upside trajectory will be as steep, tailwinds from China's tarmac resurrection as well as the upside drift of the CRB should cast the currency in a more favorable light. This dovetails with our work with the dollar - which sees the USDX rolling over into next year as commodities rally out of their late June low. 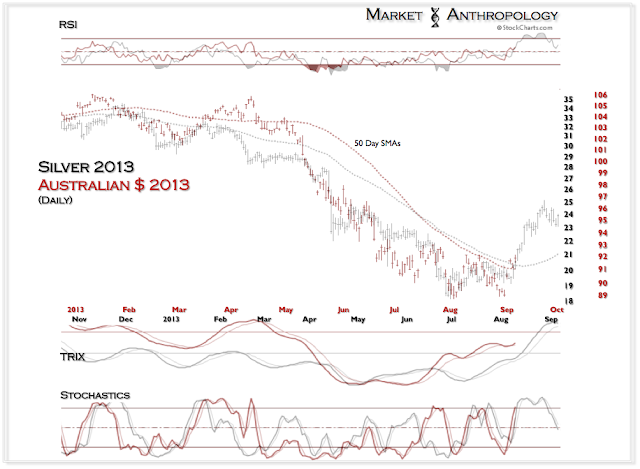 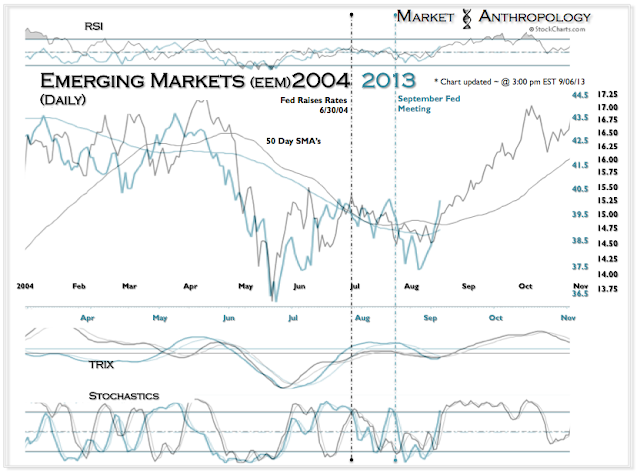 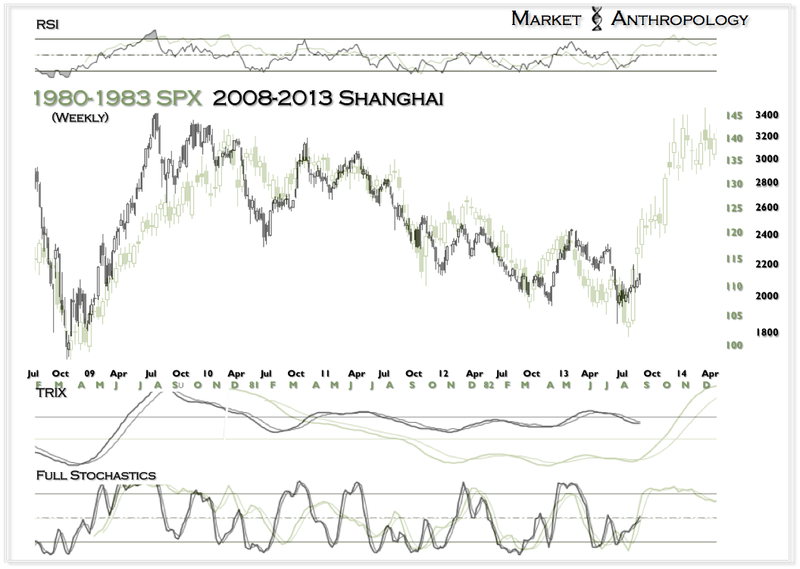 All of the foreign equity markets we have been following continue to point higher. 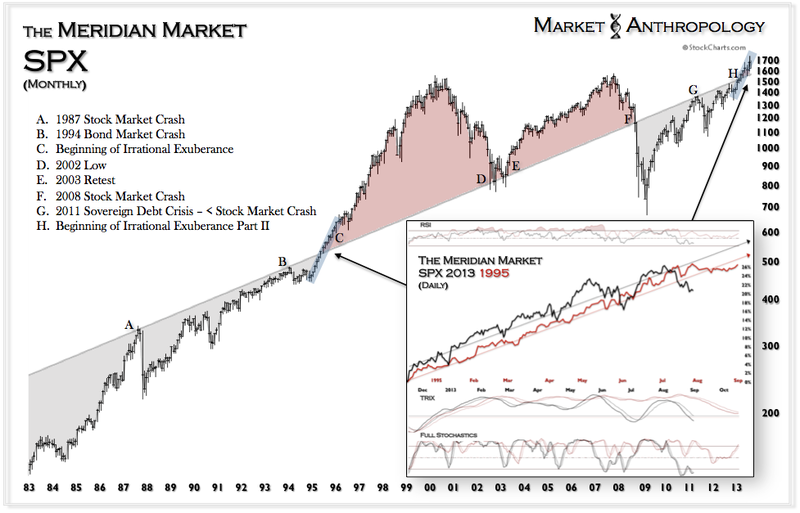 As mentioned in previous notes, although the SPX has run across the consolidation trend encountered in 2004, equities have followed the same momentum comparative where the market had four successively longer and deeper corrections - while digesting the Fed's transition to tighter monetary policy. 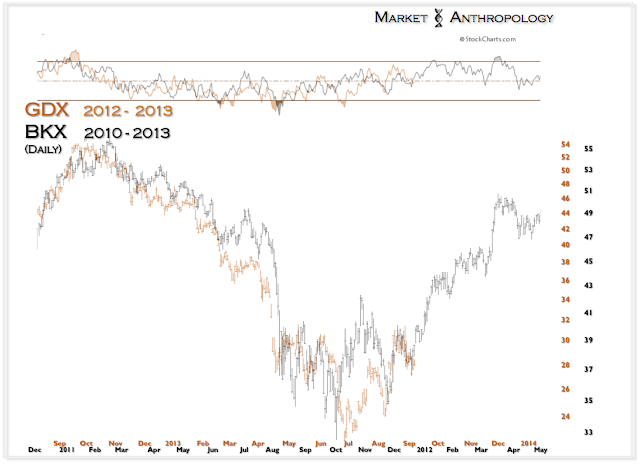 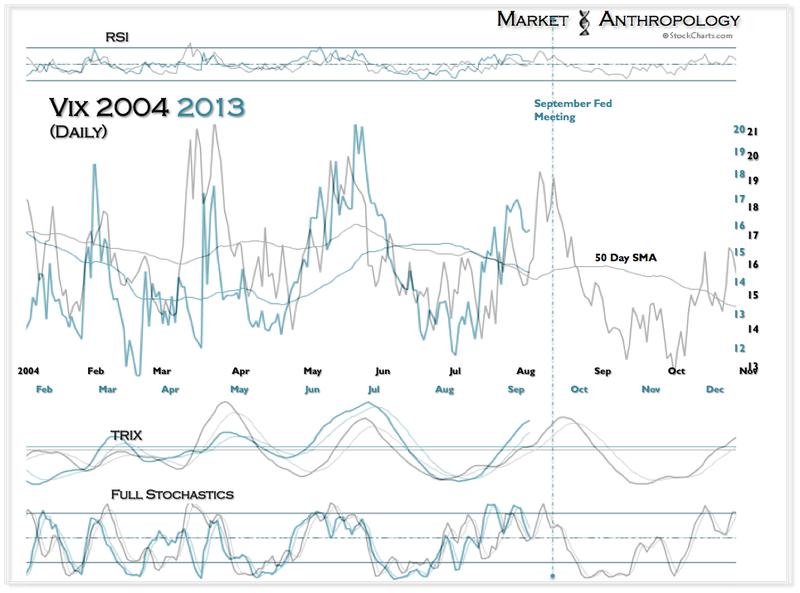 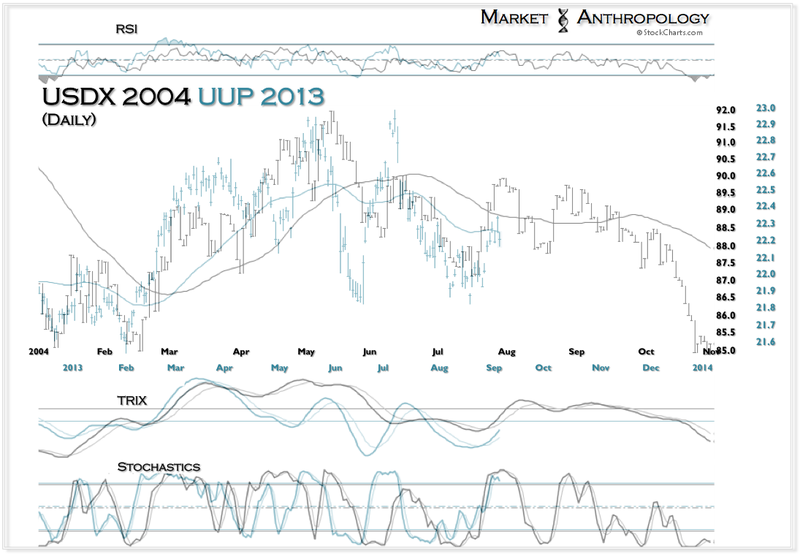 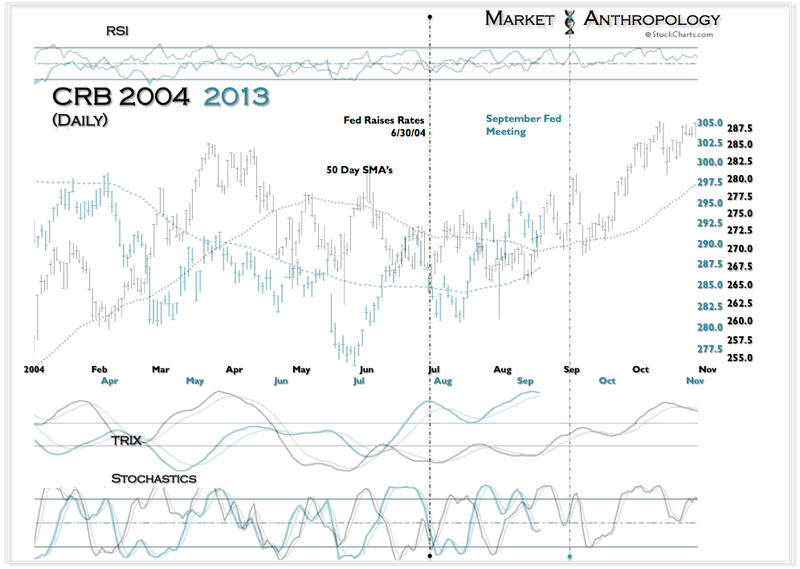 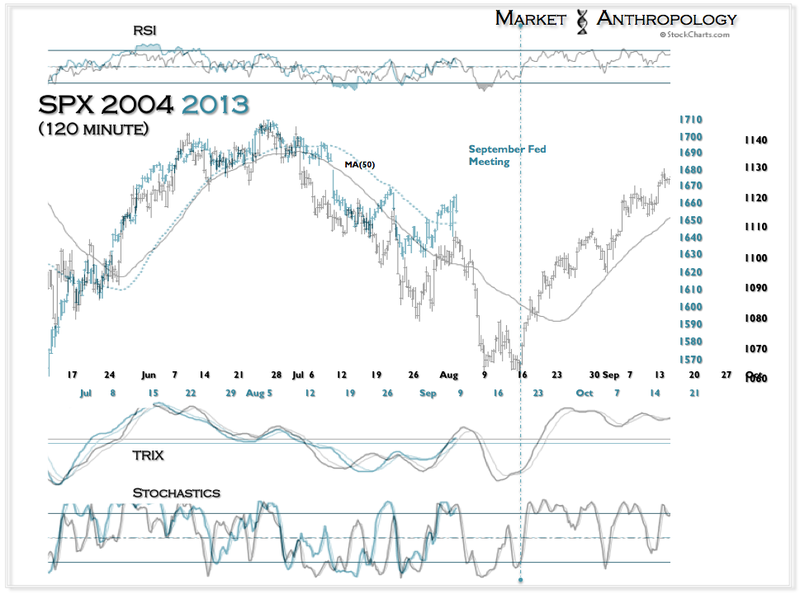 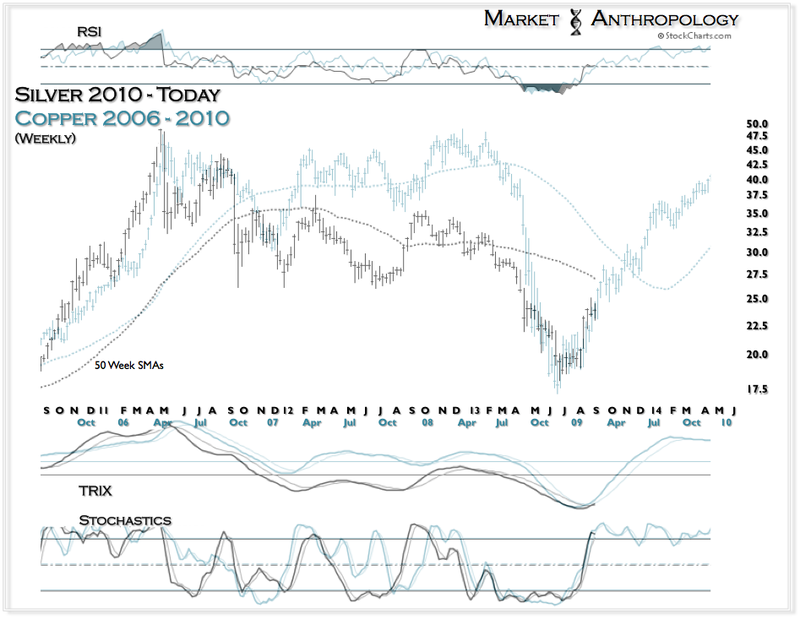 Once that transition was digested, both the equity and commodity markets broke higher into 2005. We find it noteworthy that for the CRB comparative with 2004 - although the trend profiles mirrored and ran across the grain throughout the year, the CRB is beginning to strongly trend with the comp. Widening the lens from inside, a fractal comparison of the last four (4) years of the CRB could be made to the consolidation and continuation pattern from 2004. Perhaps it's fitting that even as the equity markets trade above our demarcation of rationality - an 80% rise in the 10 year yield hasn't upset the party. 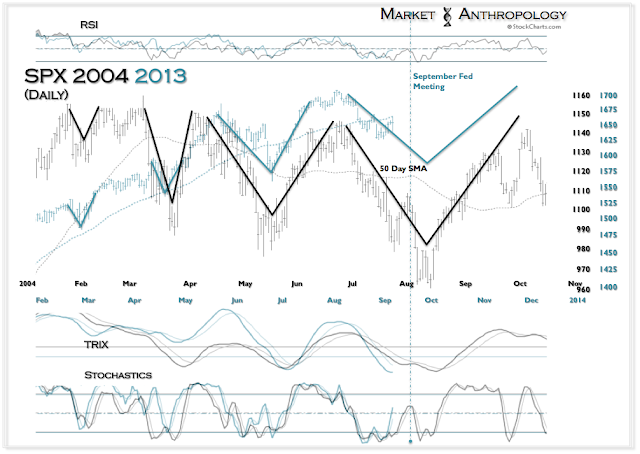 Hopefully, the gorilla behaves, although we suspect another leg lower for the SPX is in the cards. 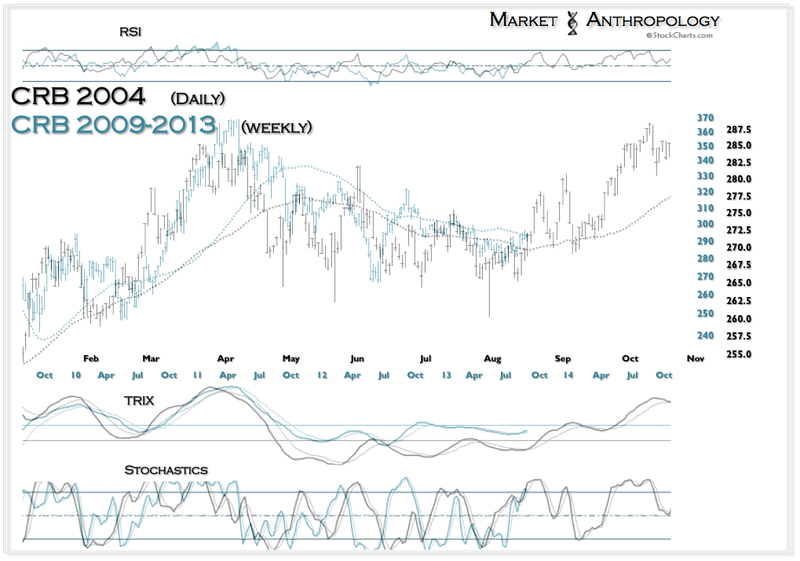 Apple has been consolidating its gains over the past few weeks. 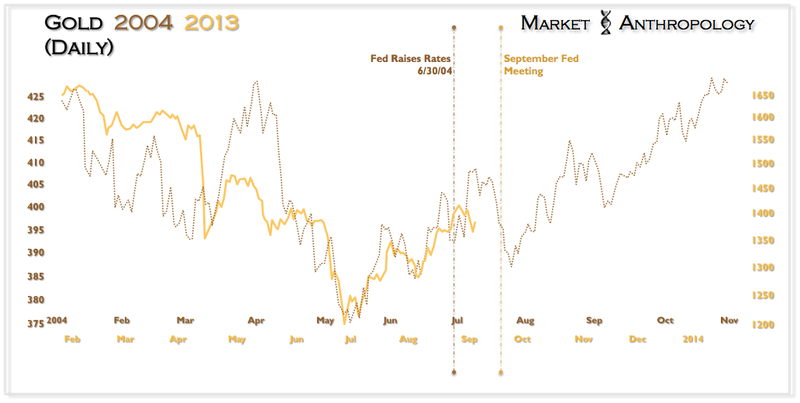 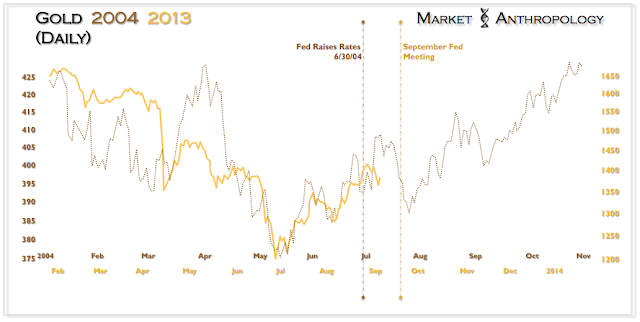 We would not be surprised to see it trade another ~ 5-7% lower before resuming its uptrend through the end of the year.